For those of you old enough to remember the 1980s, you may have been familiar with the cutting edge technology that was the Sinclair ZX Spectrum. This forerunner of the X-Box would take roughly six hours to load one game. This was a very similar scenario to what we began to experience with the old Roy Castle Lung Cancer Foundation website. Pages would take forever to load and, as a result, our SEO ranking began to be negatively affected, with us sinking from page 1 to the dreaded page 2 of Google. Our website was a tortoise and we needed it to be a hare. The web company we were working with at the time seemed unable to fix the problem, so we eventually decided a new approach was required. I believe, very strongly, the first priority of anyone developing a website should be creating great content, which is relevant to your audience. One of my favourite examples is a company called Cervelo Cycles which makes race bikes – the type of race bikes people win the Tour de France on. The Cervelo website was originally built by a chiropractor who builds websites in his spare time. The reason so many people visit the website and so many people buy its bikes is not because of its fancy website, but because it has content which is of interest to its very specific audience. Beyond great content, we also wanted something very simple, aesthetically pleasing and with fast loading pages. 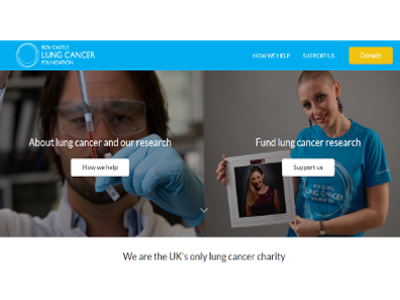 For those not familiar with the Roy Castle Lung Cancer Foundation, we are the only lung cancer charity in the UK. As well as funding lung cancer research, we are also the biggest supplier of lung cancer information to the NHS. Just over 20,000 people visit our website every month and the majority of them are people searching for information on lung cancer symptoms or treatments. We are a small charity and do not have an in-house web team so we appointed a small agency called Cleversteam, based in Liverpool where we have our head office. We decided we wanted people to visit our website for two main reasons – either to get help or for them to help us. As a result, Cleversteam developed a two-door interface on the home page, which gives visitors the choice of seeking the charity’s help or supporting its work. The website is still a work in process and we’re currently working on improving the imagery on our home page, as well as making it simpler for supporters to make donations. The website was only launched in April so it’s still too early for us to analyse its impact, but we hope it will prove key to helping us achieve our ultimate goal of beating the UK’s biggest cancer killer. 1. Focus on great content before everything else. The design and fancy functionality is often more enjoyable to work on but content is THE most important thing. Make that your priority and everything else secondary. 2. Use strong images which are relevant to your audience. It’s said “a picture is worth a thousand words,” and it’s true. 3. Make donating, registering and buying tickets for events quick & simple. Do not ask them a million questions about their age, interests & how they found out about you. You can get this info at a later date when you’ve developed a relationship. 4. Research the web company you‘re working with. Try to get references from other organisations who have worked with them in the past. 5. Check for hidden support costs. I always asked for a fixed price cost for unlimited support. Emma Gunby is communications director for the Roy Castle Lung Cancer Foundation. Prior to this she has worked as a national news journalist, a PR director and, most importantly, a beach hut attendant.